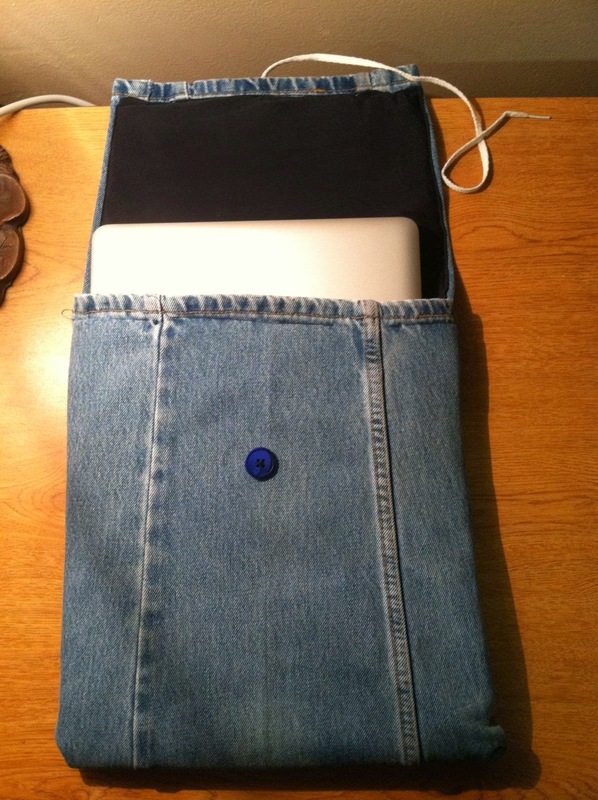 Everything has come together to compel me to write up how to make a laptop sleeve from a pair of old jeans. My niece started college this summer and asked me if I had a slim sleeve for her laptop so she didn't have to carry her whole big bag to class. I thought I had one but couldn't find it. So I made one. Later I found the store-bought one and offered to bring it to her but she said she liked the homemade one. Fall semester started yesterday. I got this text from my niece this morning. 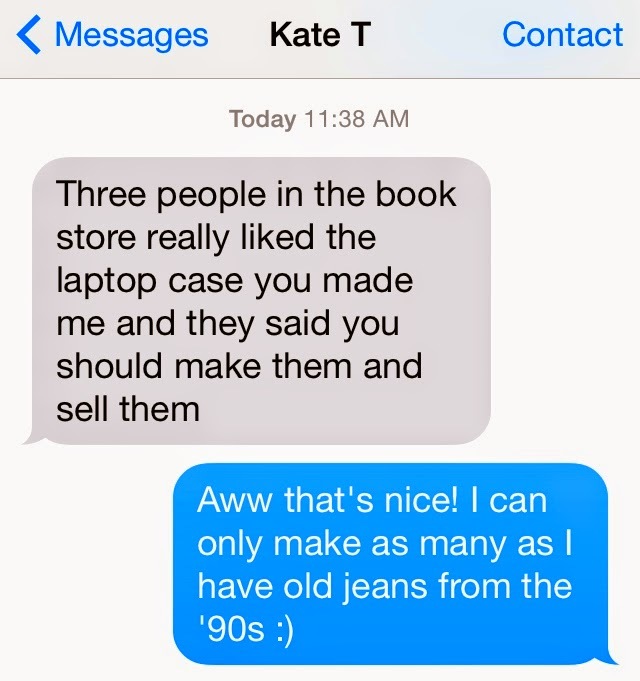 Hmm, I wonder if this admiration for her laptop sleeve has anything to with this thing that happened over the weekend? 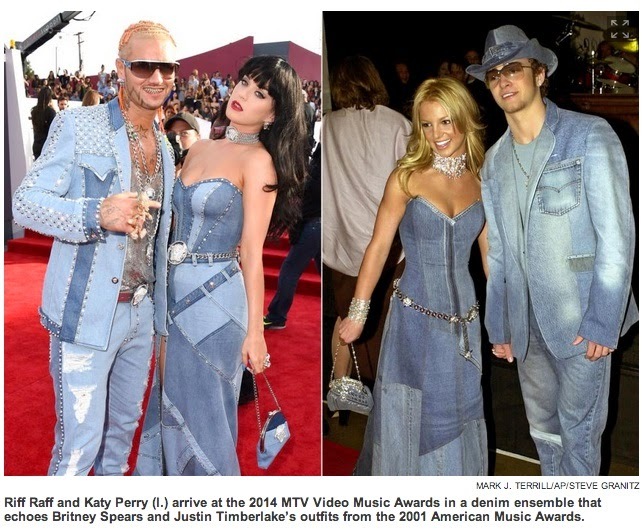 I love how it's called a "denim ensemble." I hear it in my head as AHN-SAHM-bbb, like somebody is trying to be sophisticated and then fell down the last step. My niece calls it, "Oh my gosh! That is wayyyy too much denim in one outfit". No, that is way too much denim in FOUR outfits! 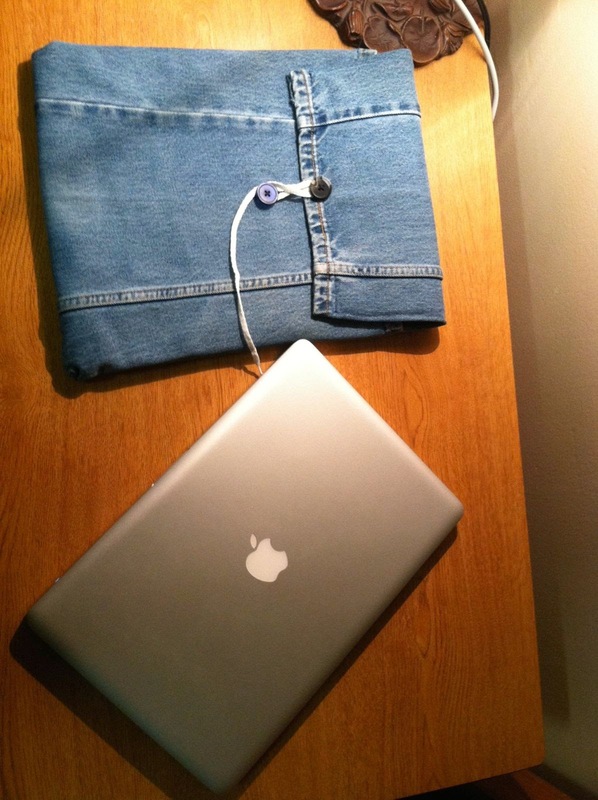 Here's how I made a laptop sleeve that has just the right amount of denim for an outfit. First thing I did was go online and find the dimensions of the laptop. My niece has a 15" MacBook Pro (she bought it herself when she was a junior in high school so she could use FinalCut Pro on it. Yes, her computer is better than mine, shut up.) The page with the Tech Specs for Macbooks is under the Support tab on the Apple website. I found the right one and used the dimensions to make a blank out of scraps of foam core. If you have the actual laptop just use that. I didn't have it. 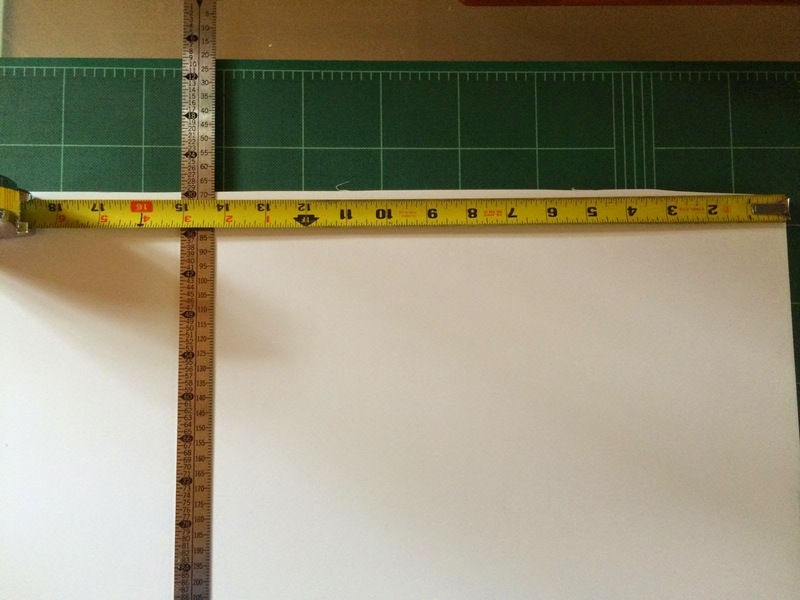 Add layers until the blank is close to the right thickness. Better over than under I think. The middle layers don't have to be full size. I stacked up various strips. I used plain Scotch double sided tape to stick it together. Get a pair of jeans from the '90s with big legs and cut the legs off. Don't worry, you are never going to want to wear them again. did not come back in style as far as I know. I split the legs up the center of the back so I'd have plain fabric to sew without the heavy seams in the way. I'm not sure how my sewing machine would handle that. Play with the fabric and your blank to see how you want to place the seams. Because of the flair of '90s jeans these seams will come out slanted, but I decided to center them. Based on the ensembles above you can see there is no right or wrong to this. I think something like this... Seam goes here. The legs of my jeans were wide enough for the laptop but it takes both legs sewn together to get them to wrap all the way around it longways. I decided to use the factory hem of the jeans at the edges of the case, so I had to let the excess overlap at a seam in the back. I could pretty much put it anywhere, but I decided to let it fall at the top of the back of the sleeve, so it was one full leg and part of the other one. 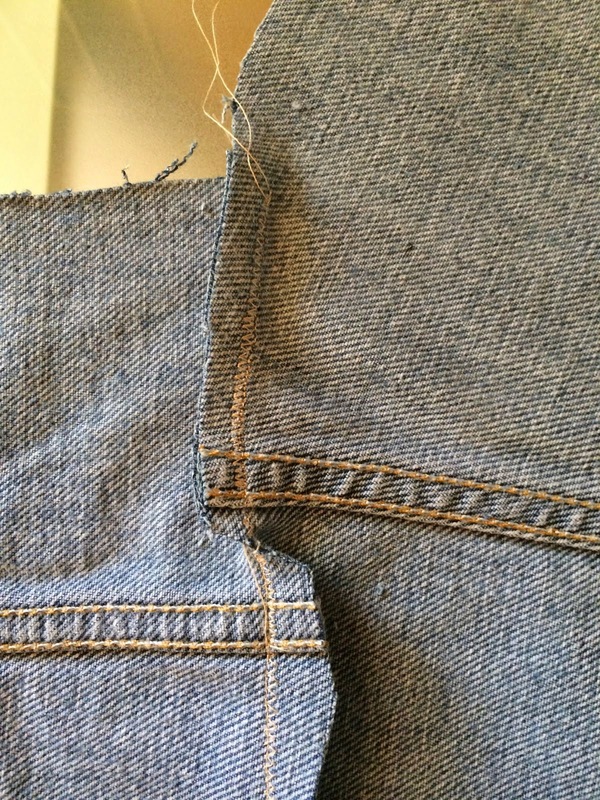 Because of the flare cut in the original jeans the original seams didn't line up at the cross seam. This probably best because they are so stiff they wouldn't lie flat if they matched. I let them offset and cut a notch so they both keep going the way they want to. Try to get the seam in the back to lie flat. After I made the legs into one long piece I folded it around the blank inside out. I decided how much of the top of the laptop I wanted to come above the front part of the sleeve so you can grab it and get it out. I pinned the sides tight to the blank and sewed it on my sewing machine. Then I trimmed the excess fabric and turned it right side out. Now this part is counterintuitive. NOW is when you want to sew the buttons on to work as the closure. I messed up and ended up reaching under the lining to sew my buttons on, fortunately remembering before I'd sewed up all the edges. Best to go ahead and sew them on before you move on. The denim is strong and should hold the buttons fine. Going all the way through the other layers is just asking for trouble. I looked through my button box and couldn't find two big matching buttons. I allowed as how my niece could change them if she found better buttons later so I just went with a mismatch. I also had a shoelace in my sewing box. I cut off one of the aglets and sewed that end under the top button. After making the outer shell I turned to the padding. I used 3mm Volara closed cell foam I had left from the Spartan project. I got it from foamorder.com. If you notice that web page says Yoga Mats at the top. By the transitive property then, you could pick up a yoga mat at TJ Maxx to make this project if you wanted. 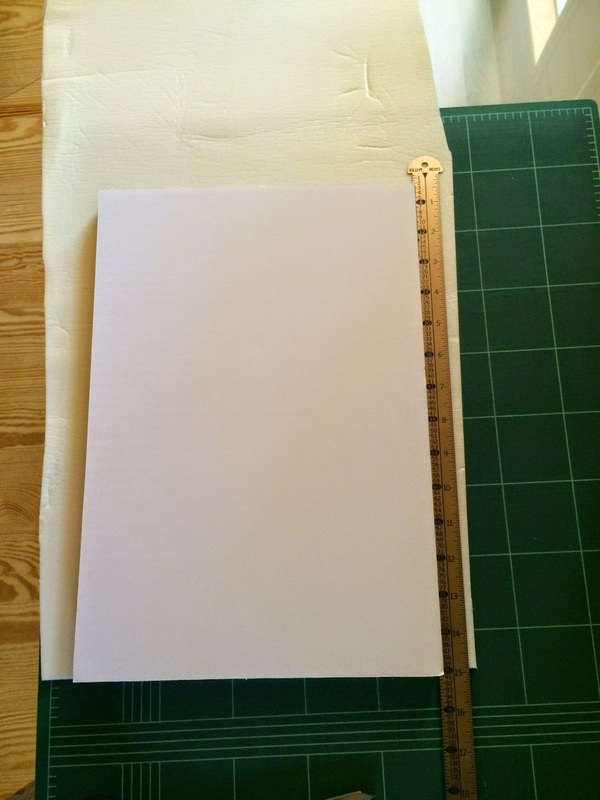 Cut the foam of your choice using your blank for a template. It needs to fold around it long ways and cover the flap too. I had a hard time getting it to come out with square corners. Watch out for the rhombus. Next it needs a lining. I had some navy blue silk jersey that a friend brought me from a business trip to China. That will do nicely. 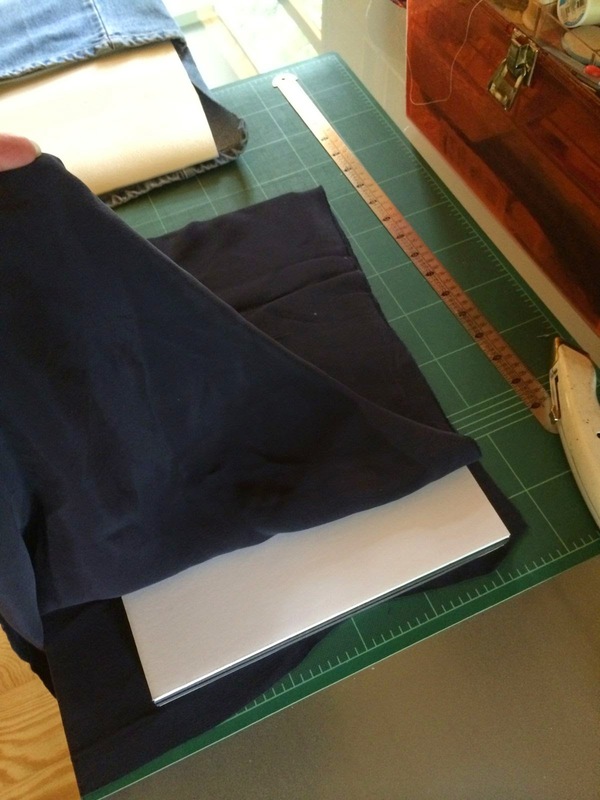 Repeat the process for making the denim sleeve to make a sleeve out of your lining fabric that fits snugly around your blank. 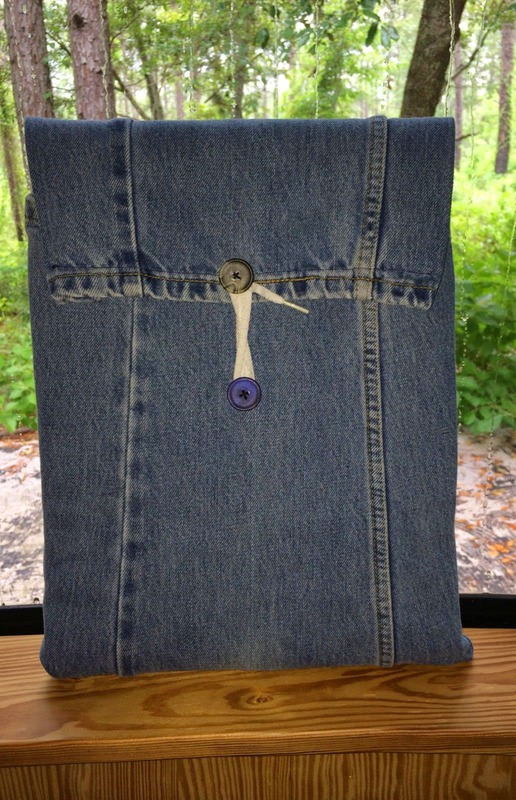 Before you sew the lining in, have you sewn on the buttons for the closure? There are lots of ways to potentially close this thing. I was just using what I had on hand. I was criticized by some for not using velcro, but I just don't think that works with this design. Other ideas would be to transfer some of the belt loops and tie it closed through those. Or attach a strap to the flap and a buckle to the front I had some buckles, but I just thought buttons would be less fussy and faster. You can get out of class in a hurry with a string and two buttons. 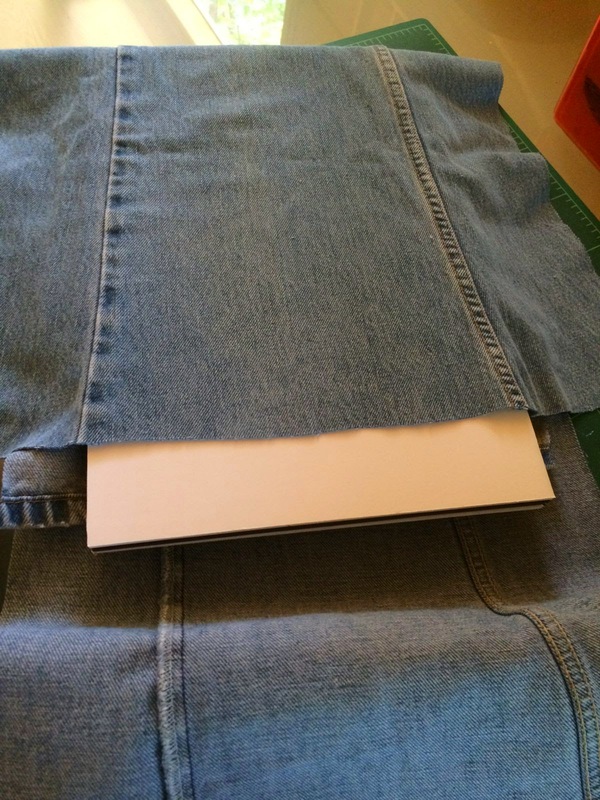 Once you have the lining made and slipped inside the foam and the denim you can figure out how to sew it in. 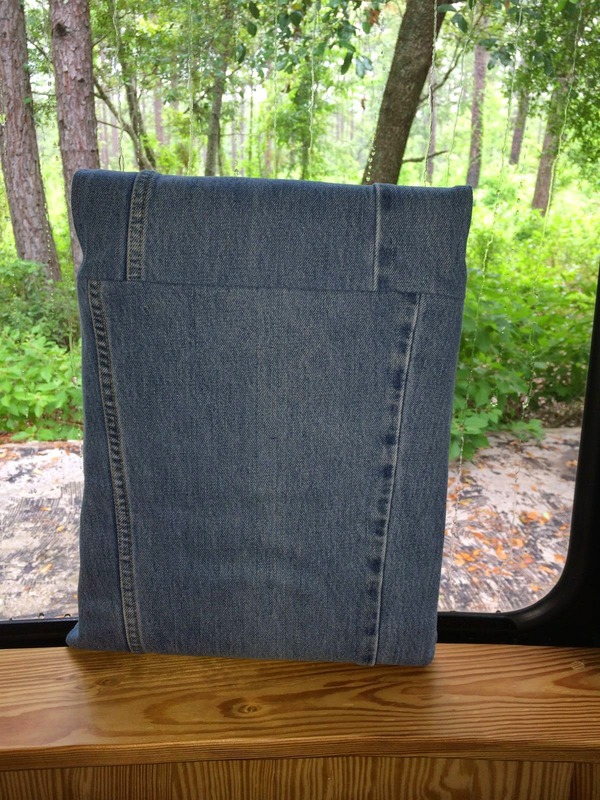 I folded in the edge of the denim of the flap, folded the lining around the foam and pinned the lining to the denim and just top stitched through the two fabrics on my sewing machine with navy blue thread. You can barely even see it. I didn't stitch through the foam. If you sew the foam it is about the same as cutting it. It just separates and you end up with a little piece bulking up the seam for no reason. I top stitched the lining to the front as well. It was hard to get up to the thick jeans seams so I did a little hand sewing to get it all secure. 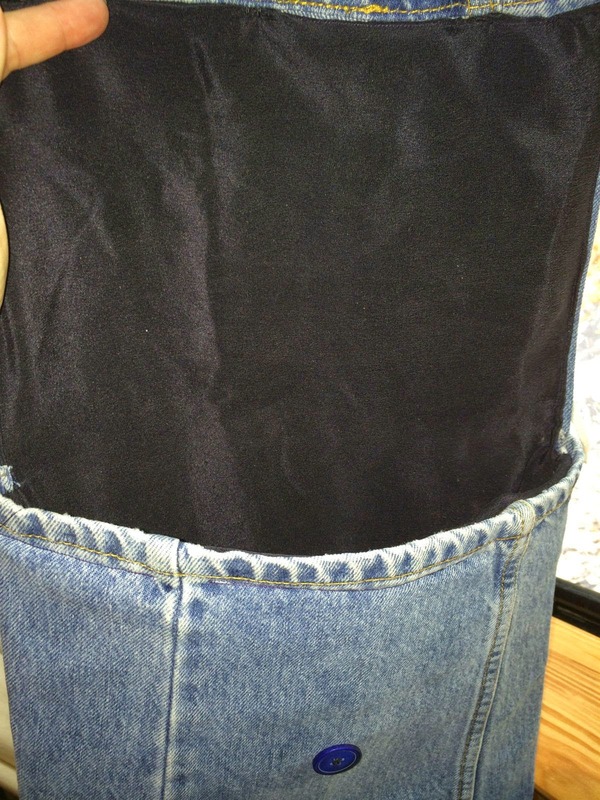 I hand sewed the lining to the denim in the bottom corners so it doesn't flip inside out like a starfish stomach. Can you find a hidden hard drive with a compass?